Welligogs is one of today’s most sought-after brands for contemporary, elegant British-styled outdoor clothing. We began our story in 2000, when we were founded by Managing Director Kim Annan as the first brand to introduce hand-painted designs onto rubber wellington boots in the UK and Europe. Ever-true to our roots as a family business, these first designs were inspired by ideas from Kim, her husband Ray and their four children. Then came our distinctive moniker – Welligogs. The name itself, says Kim, “came from nostalgic childhood memories of a loving home where everyone affectionately knew their wellington boots as “Welligogs””. Since these early days, our product ranges, designs and specialisms have grown into the Welligogs brand you see today – the epitome of distinctly-British style, uncompromising practicality and cutting-edge fashion. We also love our commitment to British-made, and are proud to produce pieces in the heart of England. An increasing number of famous faces and celebrities are often seen sporting Welligogs. Social Media forms a large part of our growing portfolio, where we love interacting with our customers new and old. It is through our social media channels where you can become more involved with us whether this be by way of a number of competitions and updates or helping us to choose names for our new products. We welcome feedback and love receiving photos of our customers wearing our products #welligogs. 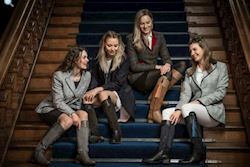 Signature Welligogs pieces include classic tweed jackets, modern styled coats and jackets, practical luxury waxed cotton, fully waterproof and windproof jackets and coats with seam-sealed membranes and waterproof, breathable leather and suede boots. Our collection is completed with quality jackets, coats, gilets and hats that exude elegance whilst providing comfort and performance. New additions for Spring Summer include stunning jackets in linen, cotton, viscose and silk as well as supremely comfortable stretch cotton shirts. We infuse classic heritage design with high-fashion for a look that’s both city-ready and perfect for countryside living. Welligogs pieces are inspired by our landscape’s magnificent colours, which we pair with modern shapes and subtle, stylish accents. We individually select exceptional quality British tweeds and other opulent fabrics, and then hand-craft with careful attention to detail. Every season, Welligogs introduces new designs and we’re passionate about evolving our product range and enhancing our collections. Pieces are only ever made with the highest quality fabrics, leathers and suedes and are infused with a trend-led flair. We are pleased to offer all members a 10% discount across our entire range. Simply enter the coupon / voucher code LR10 at the checkout.